Big Sur Half Marathon: Cheer our staff on! is one of Monterey County&apos;s premiere running events. On Sunday, two staff members of the Monterey County Convention and Visitors Bureau, Kimberly Jenkins and Pam Guenther, will be competing in the event. We interviewed both Kimberly and Pam to find out why they chose to participate in the event, how they&apos;ve trained, and what they&apos;re hoping to get out of the Big Sur Half Marathon. Why run? 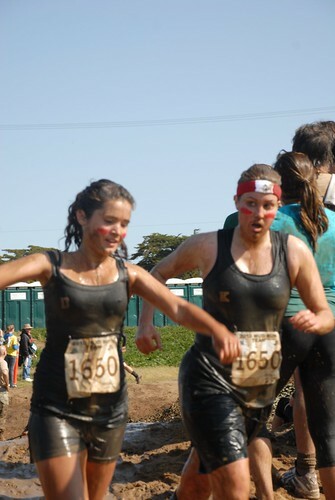 Kimberly Jenkins (right) racing in Big Sur&apos;s Mud Run in March. Sales Coordinator Kimberly Jenkins says that Big Sur&apos;s Mud Run, another big competitive event held by the Big Sur International Marathon, enticed her to train for the Big Sur Half Marathon. "I enjoyed the rush of running and the feeling of accomplishment," Kimberly, who has never run a half-marathon before, says. "I figured I&apos;m young enough, why not go for it? I wanted to be able to say I ran a half marathon." Age also played a part in Director of Finance Pam Guenther&apos;s decision to compete in the Big Sur Half Marathon. Pam, who ran her first half marathon in San Francisco a year ago, said, "I wanted to do a second half-marathon now that I&apos;ve turned 50. It&apos;s such a huge accomplishment, especially when you have asthma." Asthma was the thing that led Pam to focus on running, though not for the reasons you&apos;d think. "When I got diagnosed in my mid-30s, my doctor told me not to run anymore." She then laughed, adding, "And when someone tells me I can&apos;t do something, I have to do it!" Why the Big Sur Half Marathon? Kimberly and Pam both agree on two reasons they want to run this half marathon: because it&apos;s local and the course is exquisitely beautiful. "I love running the rec trail and Ocean View," Kimberly says. "On a treadmill it seems like work, but the views make it seem like fun!" Pam agrees. "Even though I live here, when you go out and run that course, it gives you a chance to admire Monterey Bay." Though she can run it at any time, she says it always seems special. Hopes and fears "I&apos;m worried about the distance," Kimberly says. Kimberly has focused intensely on her training over the past six months, but has yet to run 13 miles; her furthest distance to date has been 11 miles. "I&apos;m worried I&apos;ll get just about done, hit a wall and not even be able to walk and finish." Pam, who hasn&apos;t trained nearly as hard as Kimberly, is not worried about whether she can do it. "I didn&apos;t train for the first one and I lived," she says, laughing. "I hope that&apos;s the case again!" Pam&apos;s main focus is her race time. "I&apos;d like to beat my time from the last one," she says. "I&apos;d like to do it in under two and a half hours." The relatively flat course will be an asset, she says. Follow our racers! Will Kimberly complete the race, or will she have to drop out at mile 12? Will Pam achieve her goal of running the Big Sur Half Marathon in under 2 hours and 30 minutes? Come back on Tuesday, when we&apos;ll post photos of them competing in the Big Sur Half Marathon, find out how they did and ask whether they&apos;re going to do it again!